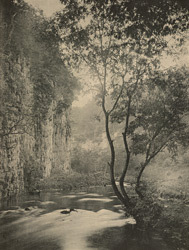 "'In Chee Dale' (H. Lees, Didsbury - Bronze Medal). A lovely peep in one of Derbyshire's most beautiful glens. Mr. Lees has very carefully selected his point of view, and the result has been a picture which leaves little room for adverse criticism. Photographers who strive after more ambitious subjects would do well to study this photograph, which amply proves the oft-reiterated advice that little 'bits' afford by far the best material for pictorial effects in photography. The lens used was a Suter 3 B, f/45, and the exposure twenty seconds." Text from "The 'Amateur Photographer' Album of Prize Photographs, 1893"